SAN LUIS OBISPO, CA — The 2014 San Luis Obispo Marathon, Half Marathon + 5K presented by Left Lane Sports created a county wide $3.28 Million Economic Impact, bringing a three year total impact of $8.49 Million for the local community since its inception. The annual three-day event with five races has grown steadily and gained a favorable reputation within the running community. Participants have rated the marathon and half marathon in the 90%+ percentile as outstanding or very good overall and have said they would recommend the event to others. In addition to the annual destination race boosting tourism and economy, over $1.3 Million has been raised for the Leukemia & Lymphoma Society to date. For 2015, organizers anticipate 5500 athletes, an increased elite field with prize money, celebrity runners with local connections, a new Saturday ‘Family Fitness Day’ and expanded school and children’s outreach. Registration for the 2015 event, April 24–26, is open and can be started at www.RaceSLO.com. The San Luis Obispo Marathon, Half Marathon + 5K takes runners through the town’s charming downtown corridor past the old Fremont Theatre, by Mission San Luis Obispo and through neighborhoods with historic Victorian and Craftsman bungalows, out into the rolling hills of the renowned Edna Valley vineyards and farm land, then back into the city center, past Railroad Square and onto the iconic Madonna Inn property for a spectacular downhill, panoramic finish in the shadow of Cerro San Luis. 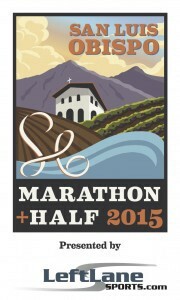 The marathon and half takes place on Sunday, April 26. The 5K race and Children’s Races are held on the Madonna Inn property. The 5K features a two-loop course and a spectacular downhill finish. The Children’s Races are fun, easy flat course, great for all ages. The 5K and Children’s Races takes place on “Family Fitness Day” Saturday, April 25. For more information about the races, course maps and to register, please visit www.SLOMarathon.com.